Ever have a problem with your beautiful crochet project bleeding? Boy, I have! Thus, began my quest to learn how to colorfast yarn! Our youngest daughter, whom I affectionately refer to as “sailor girl”, is 21 years old, serves in the US Navy and just recently moved into her very first apartment. For Valentine’s Day, I wanted to send her a care package that included some handmade items from home. One of the things I made her was a set of crocheted dish cloths. I love these crocheted dish cloths so much that I just had to share this tutorial with you in case you’d like to learn how to crochet a dish cloth! I have two patterns that I prefer for my dish cloths. I like these patterns because they create bumps and texture in the finished dish cloth that make them perfect for scrubbing dishes. When I first started making crocheted dish cloths this winter, I wasn’t sure I would like them. But after testing a few patterns and really putting them to use in my kitchen, I find I really do like them! I can remember visiting my aunt when I was a little girl and she used crocheted dish cloths. I thought they were the weirdest things ever! Why didn’t she use a dish cloth like normal people?! Well, that memory of my aunt popped into my head this winter and I began crocheting dish cloths in the evenings while watching TV with my husband. It probably takes me a couple of hours actually to crochet each dish cloth. But after a week of TV watching in the warm and sunny winters of Ohio (did you catch my sarcasm? ), you can have quite a few made up in no time. I only had one problem with my dish cloths. The dye bleeds. I don’t like it when the dye bleeds and fades and discolors everything. My pretty and colorful dish cloths soon turned into a blurred version of what they once were. This was just unacceptable to me and I knew there had to be a way colorfast yarn for my beautiful dish cloths. And, guess what? There is! Apparently, the dye in yarns is notorious for bleeding. If you’re using vibrant colors, you may even find the dye rubbing off on to your hands. 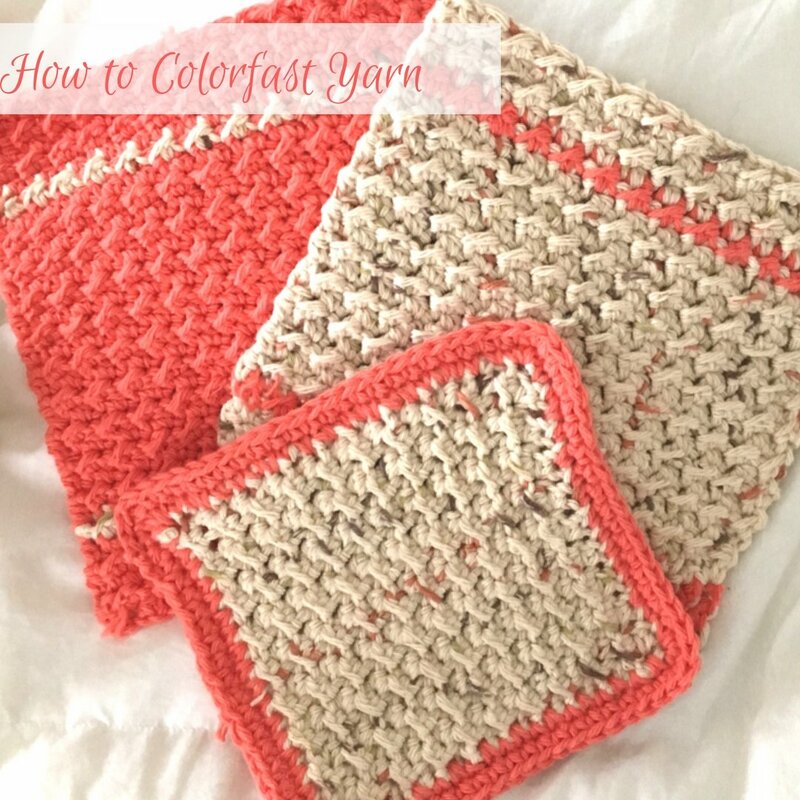 So do you know how to colorfast yarn and keep it from bleeding and fading? I actually found a few different methods, but this is the method I chose and am still experimenting with. You can colorfast your yarn before you begin your project, but it’s sooo much easier and simpler if you colorfast the yarn after completing your project. Then you’re sort of blocking your finished project and colorfasting your yarn all in one step! Now you’re ready to let your project dry. The best way to dry your project is to first lay it out on an old towel and then roll it up in the towel like a burrito. Then pound on the towel with the sides of your fists. Rotate the towel about 90 degrees and pound on it some more. Do this again until you’ve come full circle. Unroll the towel and lay your project out on a flat surface to dry. If you need to block your project you would do that now. You can watch this fun video on how to wash and block your crochet or knit projects. So, have you ever tried to colorfast yarn? If so, what method do you use. Any advice? In these dish cloths pictured above, there are flecks of color in the yarn and I found these flecks to be especially bad about bleeding. Thus, my quest to find a solution to this problem. 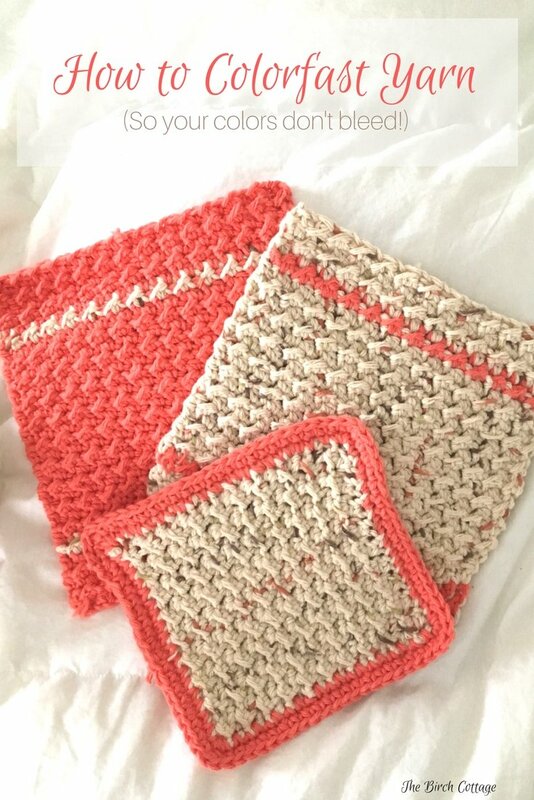 The dish cloths look so bright and the salmon color adds a nice contrast, but I really can’t stand that they bleed so badly. I’ve tried this vinegar method on several different test colors, so I’ll be sure to let you know in the coming weeks just how well this method worked. But, like I said, if you have a tried and true method, I’d love to hear about it! Wendy, I have a couple of patterns to share, but I really wanted to figure out this color bleed problem first. Thanks!! I have a couple of patterns to share but this color bleed problem was driven by me nuts so I had to figure that out first. What a wonderful and useful idea! The dish cloths are quite lovely, also. Is there a link or post for the patterns? My fingers are itching to crochet up a few, LOL!